Everyone, ECAB is about to get seriously bi-coastal. I'm excited to tell you that I've been selected to be a 2012 Code for America fellow. This is a honor and I cannot wait to meet the other 24 fellows I'll be spending the year with - in San Francisco. That's right, I've only just moved into a new apartment in Boston and now I'm moving to California! Things happen that way sometimes. But, what's more is that I'm leaving Boston in less than two weeks! It's very fast. It's stomach ulcer creating fast. Needless to say, I haven't had much time to make much because I'm packing back up again. I'll be wrapping up work at City Hall next Friday and taking a work hiatus for two months. I'll hopefully fill my time traveling, visiting friends, relaxing and then gearing up for this new adventure. This means I won't have my sewing machine with me so expect my posts to be a little different during this time. This new life may really shake up what I'm posting about -- I have no idea what is in store, and that's exciting! Currently I'm in operation eat all that you already have mode so I made a big batch of muesli last night. I'll try and kill off as many grains and beans as I can, too, in the coming days. This 101cookbook recipe for red lentil soup is one that never disappoints. Meanwhile, Elizabeth is frolicking in Europe with her husband. I'm sure she'll come back with a mega-ton of inspiration. Right before they left, I was back in Georgia and we got together. We also took our first picture together in maybe over two years. For better or worse, here we are, the two that make these things and this site. We have full time jobs, lives and our posting (as you might have noticed) will wax and wane with changes in such. It is a pretty accurate account of what we're up to, or not up to, at any given time. We try to post as much as we can and create as content heavy and meaningful posts as we can and we're awful glad you come by! Directly above: Jessica, Elizabeth and Huey. Top most photo: a tilt-shift photo I did of my old neighborhood in Boston, Back Bay. Wow I just did a little research about 2012 Code for America fellows and must say I am impressed! Congratulations!! Ditto to Peggy's comment - congratulations! How exciting! I always look forward to ECAB's posts, regardless of the subject, so I look forward to whatever direction the blog goes in as a result of this exciting opportunity. Ohhhh. I like the photo! 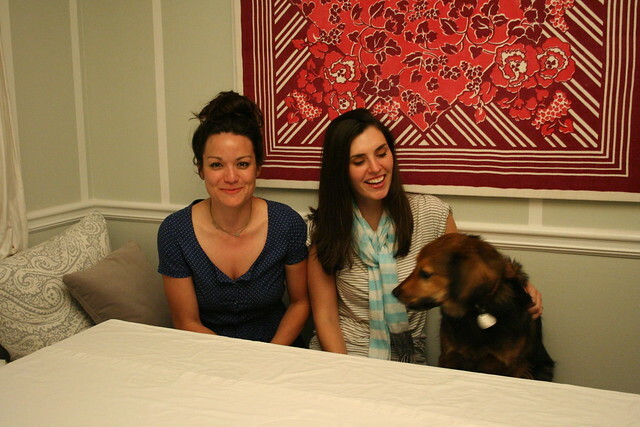 And, I love that pretty, sweet, little puppy dawg patiently awaiting his portrait.